Move over Channel 4, UofG has got some highly talented bakers on campus. It was the showstopper challenge to end all showstoppers as UofG researchers were challenged to produce delicious bakes inspired by their research for the PGR & Postdoc Bake-Off, and they certainly rose to the challenge. 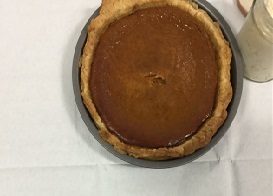 Thirteen bakers went above and beyond in their task, even making their own pastry and fondant for their creations. With cakes inspired by the Zika virus and the music from, to stiletto-shaped cupcakes and hard drive cookies, judges Liberty Vittert and Scott Ramsay, aided by the Gilchrist’s regular pub quiz host Kenny Anderson, had some difficult- and delectable- decisions to make. One by one, each baker brought their bake to the UofG Bake-Off altar, and nervously awaited the judges’ comments, as Liberty and Scott considered the bake’s taste and appearance, as well as its connection to the baker’s research. After much deliberation, the runner-up prizes were awarded to the cutest and creepiest bakes of the evening. Denise Hough’s sheep-shaped cake was easily one of the cutest bakes of the evening, and after eventually persuading the judges to cut into her creation, she wowed everyone with some beautiful rainbow sponge layers. 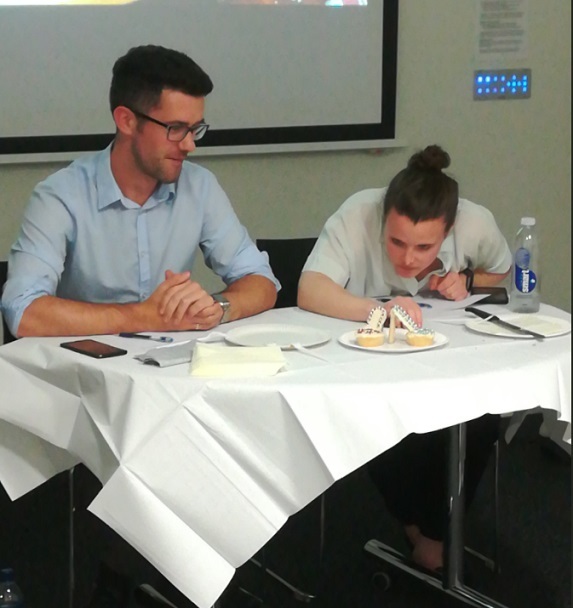 Meanwhile, Fabienne Westerberg astounded the judges with her eerily realistic mouth-shaped cake, inspired by her research focusing on the tongue shapes associated with Swedish vowel sounds. 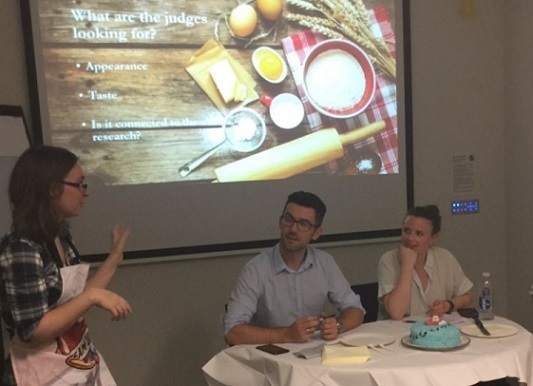 Heather Hulme was crowned PGR & Postdoc Bake-Off Star Baker, having achieved the impossible and made the human gut look appetising to both the judges and audience; producing a light and moist sponge, and decorating with her home-made fondant icing. Special mentions were also awarded to Aleksandra Bavdaz, who left with the People’s Choice prize for her simple and elegant cheesecake inspired by her research into marketing and promotion, whilst Zoe Bartliff impressed the judges with her tarts representing the four aspects of the medieval Welsh law texts, the Laws of Hywel Dda. Oct 2 Sun, Sea, Sand and…Scotland?